In sports medicine, physicians focus on cartilage, discs and nerves, but we rarely talk about ligaments which keep your bones together, except when it comes to a knee injury. Once a ligament is injured, the structure it holds together tightly becomes loose. With loosening, abnormal motion develops in the joint resulting in occasional pain and a progression to osteoarthritis many years later. With the huge number of musculoskeletal injuries that are treated yearly in the U.S., we need to think more holistically about joint injuries. Unfortunately, those injuries that physicians do not treat properly, results in another joint replacement or an additional member of the millions of Americans who are permanently disabled. In my practice, I have been able to treat injuries, even many years later, when I include ligaments in the treatment plan. 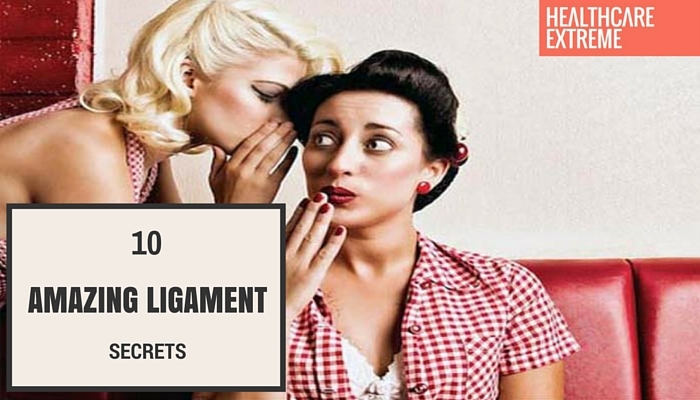 Ligaments are amazing structures, and if you know a little about them, you will able to keep them healthy and live pain-free. Musculoskeletal disorders are the most frequent type of chronic pain condition (Murray CJL, 2012; United States Bone and Joint Initiative, 2014), and is a leading cause of disability in the United States affecting almost 160 million people (IOM, 2011). This type of pain develops when local nociceptors detect chemicals released from damaged tissues such as of the joint capsule, tendons, ligaments and fascia. Nociceptors are free nerve endings that originate in the dorsal root ganglia that release a number of substances including calcitonin gene-related peptide (CGRP) and substance P. These substances are known to cause cellular changes in nerves that result in local tissue sensitization as well as modify central pain pathways (Sanchi-Alfonso V 2000; Seybold VS, 2009). There are many pain generators within tissues, but it is thought that most of the pain associated with musculoskeletal injuries originates from the weakness or laxity within the enthesis of tendons and fibro-osseous junction of ligaments. The structure of tendons and ligaments relates to their function, hence the tissue matrix array reflects the tissues biomechanical roles. Tendons transmit muscle contraction strength to bone, whereas ligaments transmit forces across bones. 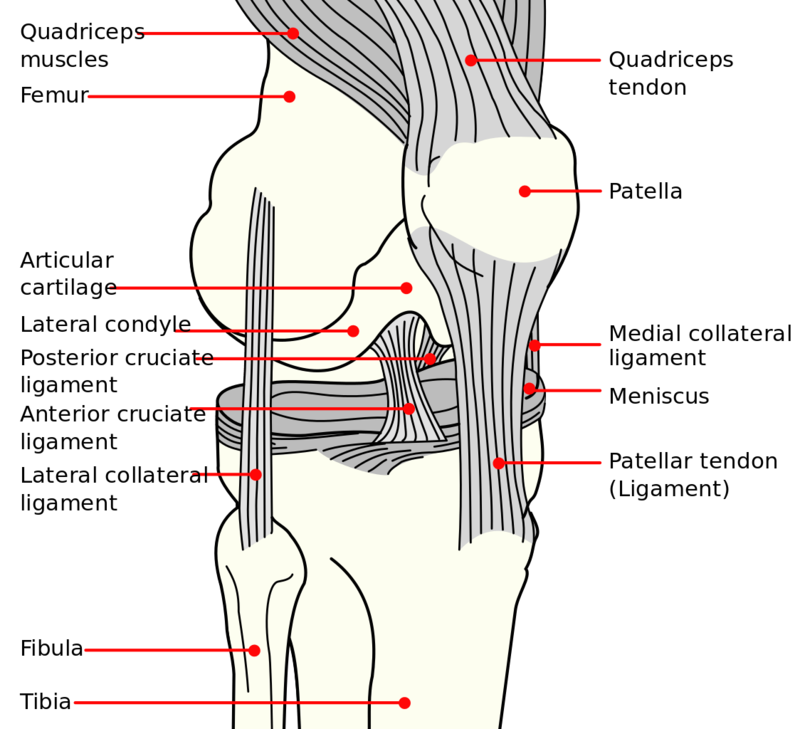 The thick collagen bundles that make up ligaments are generally aligned along the long axis of the ligament, although not as completely as in a tendon. A ligament may appear as a single structure during joint movement, but at a microscopic level, fibers may tighten or loosen depending on their specific position and the overall force that is applied (Frank, 2004). Unlike tendons that aligned in one direction, ligaments are aligned in a web to keep the joint stable in many different positions. Each collagen bundle is made up of a collagen matrix with interspersed fibroblasts which are responsible for collagen synthesis and repair (Frank, 2004). Two-thirds of the ligament weight is water which provides its characteristic viscoelastic properties. The remaining 1/3 is a mixture of collagen (85% of which is type I), glycoproteins, elastin and proteoglycans (Frank, 2004). At the molecular level, collagen is synthesized as procollagen molecules that are secreted into the extracellular space, then the helical collagen molecules line up to form fibrils and subsequently collagen fibers that make up the ligament. An enzyme called lysyl oxidase promotes the placement of crosslinks within and between the collagen molecules. This crosslinking creates the tremendous characteristic strength of ligamentous structures (Frank, 2004). 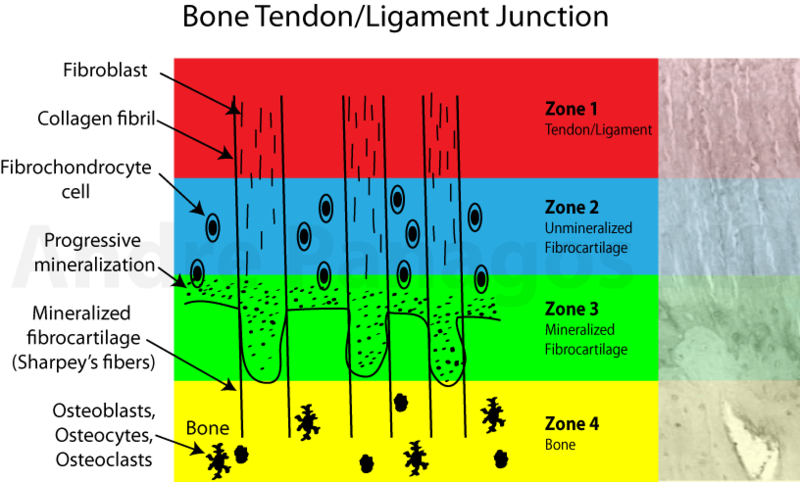 Direct bonding among structurally different materials can be challenging and the body gets around this problem by using a sequential arrangement of tendon or ligament, fibrocartilage, and mineralized fibrocartilage (Sharpey’s fibers) that insert perpendicularly into the bone at the junction. There is significant force that is transmitted through this area so injury and tissue damage most often occur at this junction. Fibroblasts are responsible for matrix synthesis and repair and appear isolated and interspersed throughout the ligament. They are thought to communicate via cytoplasmic extensions that may extend long distances resulting in a complex 3-dimensional structure (Benjamin, 2000; Lo, 2002). Gap junctions have also been detected within the cytoplasmic extensions suggesting a potential to coordinate tissue-wide cellular and metabolic responses (Frank, 2004). This gives fibroblasts the capacity to coordinate regional tissue repair. Ligaments exhibit both nonlinear and viscoelastic behavior with physiologically normal loading. The microstructure of ligamentous structures are made up of collagen bundles aligned along the long axis of the ligament with a crimp or “waviness” along its length. Crimp is thought to play a specialized biomechanical role during loading, allowing the collagen fibers to straighten (uncrimp), so the ligament may elongate without tissue damage under a constant or cyclically repetitive load (Amiel, 1995). It results in a nonlinear elasticity, but with continued loading, a nearly linear stiffness develops until complete failure of the tissue. Viscoelasticity refers to the time dependent mechanical relationship between stress and strain that is not constant but dependent on the time of displacement or load. In other words, tissues are stiffer and stronger with high strain than with low strain. There are two major types of viscoelastic behavior, creep and stress relaxation. Creep describes increasing deformation under constant load. This contrasts with elastic material which does not deform no matter how long the load is applied. 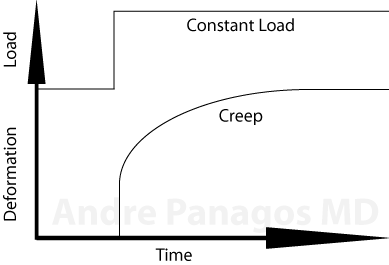 If a ligament is placed under prolonged stress, within its load-bearing capacity (such as in prolonged slouching) then the creep will not immediately return to its pre-load form (loss of energy) because of a concept called hysteresis. Hysteresis describes how once a force is applied that has stretched the tissue and it is then removed, the tissue doesn’t return to its original length. This has to do with energy loss during the stretching process and the process of breaking bonds that had formed between the collagen (hysteresis may be temporary if bonds reconstitute). This process occurs with progressive stretching of tissues. 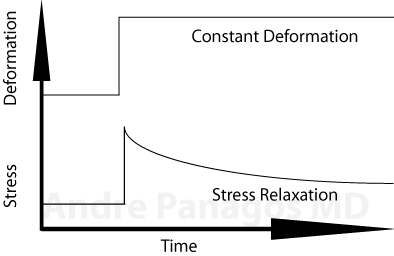 The second form of viscoelastic behavior is stress relaxation. This tissue characteristic describes how stress on a tissue will be reduced or the stress within the ligament will decrease under a constant deformation or strain. 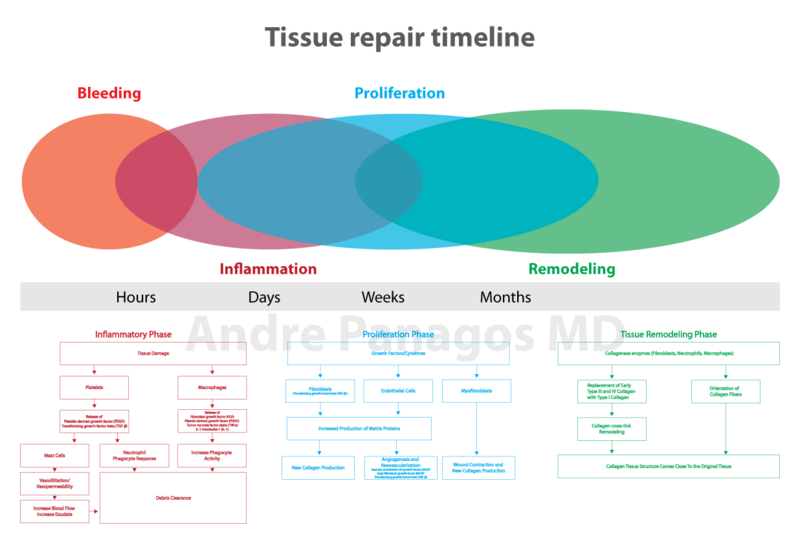 Ligament healing occurs in three phases: bleeding/inflammation, cellular and matrix proliferation and remodeling with maturation. In the first phase, the ligament ends retract with the formation of a blood clot which is replaced with cellular infiltrate, with associated increased vascularity at the site. In the second proliferative phase, scar tissue is formed by hypertrophic fibroblastic cells. The scar tissue progresses after a few weeks from an initially disorganized structure to well aligned but smaller collagen fibers made up to more type III and type V collagen. The third and final phase of ligament healing is the process of remodeling and maturation. 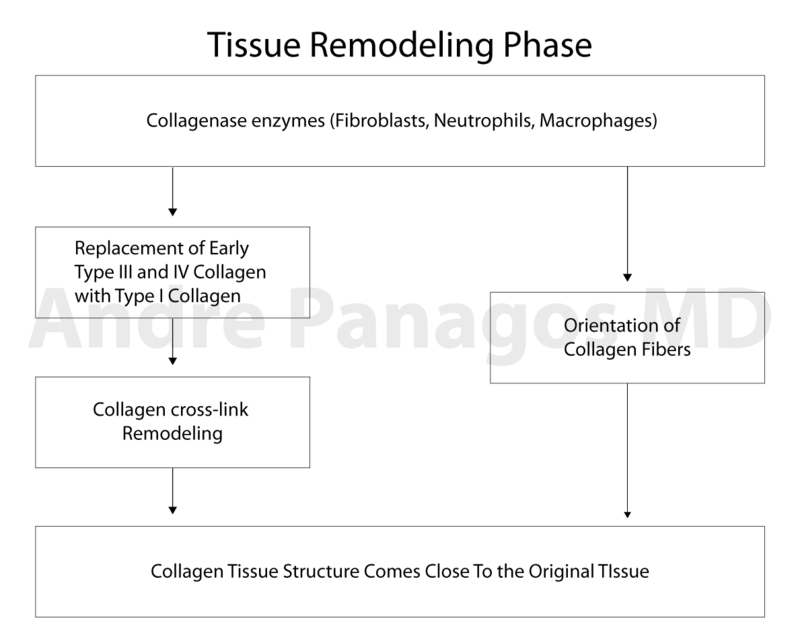 In this phase there is continued work on the altered collagen types, continuing collagen crosslinking, thickening and maturation of the collagen fibrils as well as improved cell connections and innervation. In this phase, the viscoelastic properties can recover to within 10-20% of normal, meaning that the healed ligament is less efficient in maintaining a load. Ligament scars also demonstrate inferior creep properties. Complete ligament healing continues to be elusive (Frank, 2004), and the final overall strength of a ligament is also affected by its location, degrees of crimp, aging, pregnancy, diabetes, immobilization and use of NSAIDs. If the mechanical properties of the ligament are temporarily altered, it cannot sustain reapplied loads in the normal way, so it is prone to injury in a process called fatigue failure. Each subsequent application of force further weakens the tissue although the damage may not be apparent. With further repetitive activities, the weakness will accumulate and the tissue will eventually fail at a much lower load than what would be expected to result in injury. Repetitive physical activity and reloading of the ligament over prolonged periods without sufficient rest and recovery creates cumulative micro-trauma. This results in chronic inflammation that is associated with collagen matrix atrophy and degeneration creating a permanently damaged, weak and non-functional ligament (Leadbetter, 1990). A silent chronic inflammation that in some cases may have been developing over many years appears one day as a permanent disability associated with pain, limited motion, weakness and other disorders (Safran, 1985). A common analogy is metal fatigue and subsequent failure that occurs with repetitive bending of, for example, a paper clip. Bending a paper clip once will not result in metal failure, but with repetitive bending, the metal will fatigue and ultimately fail. This is why tissues fatigue and eventually fail without a history of obvious trauma. With a sprain injury or a partial rupture of the ligament, the healing process, may not result in full recovery of the functional properties of the tissue with up to 50-70% of the ligament’s original structural and functional characteristics restored (Andriacchi, 1956; Woo, 1980). Chronic musculoskeletal pain is due to incomplete repair of fibrous connective tissue which results in ligament and tendon weakness or laxity. When these damaged tissues are quickly loaded, mechanoreceptors are activated to protect the tissue resulting in pain (Leadbetter, 1994). Incomplete healing is common after a tendon or ligament injury (Browner, 1992). Even submaximal activities that are repetitive may also result in tissue damage, but may not be sufficient to stimulate a healing response so there is an accumulation of tissue overload and damage which is imperceptible until there is enough tissue damage and patients will describe a sudden onset of pain. The use of NSAIDs may also delay or even limit the healing response as well. Electron-microscope images of ligaments reveal that submaximal loading can disrupt some fibers. Some collagen fibers can lose their wavy appearance suggesting the development of a permanent deformation. This suggests that ligaments may continually experience microstructural damage as a result of strenuous activities. This results in overuse injuries as the tissues become further damaged and weakened, resulting in a chronic pain syndrome. With immobilization or reduced physical activity there is decreased overall collagen mass and metabolism, collagen fiber diameter, fibril density and fibril number (Amiel, 1983). Immobilization also results in increased osteoclastic activity with resorption of bone and disruption of the pattern of ligament fibers that insert into the bone (Woo, 1987). Yet with moderate repetitive ligament stimulation coupled more importantly with appropriate rest and recovery allows a tissue to increase its strength and thickness to protect joint stability in persons exposed to increased physical activity (Suominen, 1980). Studies have shown that a greater amount of time is needed to regain original strength than the original immobilization (Noyes FR, 1974). It is thought that regular exercise may retard age-related physiologic decline as much as 50 percent (Menard D, 1989). Muscles can also fatigue, but because of their contractile ability, they rarely fail. Muscle spasms occur when the joint capsule, ligament or intervertebral discs are damaged. Muscle spasms occur to brace and protect the damaged area but can also contribute to the symptoms of local pain and stiffness. Muscle fatigue, which also results from sustained postures, such a prolonged slouched posture results from muscle overload. They are overloaded while trying to support a less than optimal upright position, the accumulation of metabolites and less than optimal blood flow or ischemia results in the perception of pain. The constant muscle contraction limits the free flow of blood through the muscle stimulating pain fibers. If you move and stretch, blood flow is improved and the muscle pain is reduced. Shortened and tight muscles can also restrict the joints leading to greater problems in the future such as osteoarthritis and injuries that do not heal. Tendons transmit muscle force to bone and dissipate energy where as ligaments augment joint stability and guide the direction and magnitude of joint motion. The free nerve endings present in ligament are thought to act as mechanoreceptors that detect joint position, speed, and movement (Akeson WH, 1984) and they are also thought to transmit nociceptive information as well (Panjabi, 1992). Hence, injury in one segment of the body may refer to distant body parts via the sensory nerve endings within ligaments (Rhalmi, 1993). A reflex activation of muscles by stimulation of the ACL was first noted in 1987 and a ligamento-muscular protective reflex was then identified in most extremity joints (Solomonow, 1987; Solomonow, 2001). The reflex pathways communicate ligament strain to the central nervous system. If it is abnormal, it will then respond by stimulating specific muscles to contract to prevent further joint displacement or injury resulting in muscle spasms. Research has shown that full stabilization of the joint complex can resolve associated trigger points or muscle spasms (Dagenais, 2007; Jansen, 2008; Jensen, 2008; Rabago, 2013). The effects of prolong (50-minute) static flexion of the lumbar spine was done in an animal study (Williams, 2000). Multifidus EMG activity was present upon initial stress of the supraspinous ligament, but the EMG activity gradually decreased in the first 3 minutes as relaxation occurred within the viscoelastic structures. Following 10-50 minutes of static physiologic loading, multifidus, spinalis and longissimus EMG activity was demonstrated, which corresponds to muscle spasms (Williams, 2000). This study suggests that accumulated submaximal stress of passive tissues may eventually result in damage with reflexive spasms and pain (Adams, 1996). In vivo studies have demonstrated increased muscle tension with two hours of sitting which increases the overall muscle tension within the lumbar spine in addition to the loss of the reflexive inhibition (Beach, 2005). Spinal ligaments may remain compromised for at least seven hours after unloading (LaBry, 2004). This may be due to micro-trauma and acute inflammation within the viscoelastic tissues, a process which has been documented within the supraspinatus ligament (Solomonow, 2003). Continued buildup of inflammatory mediators within the tissue may cause characteristic pain the following morning after sustained strain. Injury is not associated with the magnitude of the load but the duration of the load (LaBry, 2004). Cyclic loading allows for brief periods of partial recovery between each repetition of flexion hence the need for frequent breaks with prolonged sitting (Little, 2005). Studies have shown a reduced resistance to bending after one hour of submaximal lumbar flexion (Adams, 1996). In one study using human volunteers, 20 minutes of deep flexion followed by a 25 minute rest period resulted in a 50% recovery, and a 50 minute rest period resulted in a 70% recovery from the resulting creep (McGill, 1992). This suggest that recovery rates are longer than expected, and possibly greater than 2 days (LaBry, 2004). These findings explain why sedentary desk jobs increase the risk of mechanical low back pain. Narcotics alter the neurological feedback responses of the body, and may also suppress immune system function (Roy, 1996). Opiates have the same action as cytokines and can modulate the immune response by interacting with central and peripheral nervous system receptors creating neuroinflammation, similar to an endotoxin, in the central nervous system (Wang, 2012). Potential mechanisms of this activity include effects on the hypothalamic-pituitary-adrenal axis and the autonomic nervous system. Opioid receptors have also been identified in peripheral nerves and immune inflammatory cells (Vallejo, 2004). Morphine (a type of opioid) has also been found to prolong recovery from neuropathic pain in animal studies (Grace, 2016). Anti-inflammatory drugs are only mildly effective in relieving the symptoms of most ligament, tendon and muscle injuries and are potentially deleterious to soft tissue healing (Mehallo, 2006). They are not recommended for muscle injuries, bone (or stress) fractures, or chronic tendinopathy (Ziltener, 2010). A review noted that there was insufficient evidence of a detrimental effect in soft tissue healing when using NSAIDs at standard doses for ≤2 weeks. A limited number of studies demonstrated the impairment of soft tissue to bone healing (Chen, 2013). NSAIDs work by blocking cyclooxygenase enzymes, which convert arachidonic acid to prostaglandins that are involved in the healing response (Radi, 2005). They have been found to delay but not impair ligament healing (Warden, 2006). NSAID should be more carefully used in ligament injury, joint injury and osteoarthritis (Paoloni, 2009). Corticosteroids are known to have inhibitory effects on glycosaminoglycans, proteins, and collagen synthesis (Hollander, 1974). The anti-inflammatory effect of corticosteroids can result in a decrease load to failure of a partially injured tendon (Kapetanos, 1982). Dexamethasone has been found to decrease cell number and collagen synthesis within tenocyte cultures in a concentration-dependent manner with direct effects on tenocyte proliferation and collagen accumulation (Scutt, 2006). Ligaments, not muscles, control how forces go through your joint and keep your joints healthy in many different positions. Ligaments have immense strength; do not stretch them out too far or for too long. Ligaments do not always heal. Repetitive strain injuries develop over many years, then appear one day and for no apparent reason. Too much rest results in ligament weakness. Muscle spasms result from a ligament injury, not a muscle injury. Weakness can result from a ligament injury. Ligaments take longer to recover than you really think. Osteoarthritis begins with a ligament injury which causes progressive joint instability. Routine medications can prevent your ligaments from healing. If you like this post, please recommend or share this article with friends and family. Don’t forget to sign up for more in-depth research to keep strong, fast and smart. Acaroglu ER, Iatridis JC, Setton LA, Foster RJ, Mow VC, Weidenbaum M. Degeneration and aging affect the tensile behavior of human lumbar anulus fibrosus. Spine (Phila Pa 1976). 1995 Dec 15;20(24):2690-701. Adams MA, Dolan P. Time-dependent changes in the lumbar spine’s resistance to bending. Clin Biomech (Bristol, Avon). 1996 Jun;11(4):194-200. Akeson, W.H., Woo, S.L-Y., Amiel, D. and Frank, C.B. (1984). The chemical basis of tissue repair. In L.Y. Hunter and F.J. Funk (Ed.) Rehabilitation of the Injured Knee (pp. 93-104). St. Louis: C.V. Mosby Company. Amiel, D., Akeson, W.H., Harwood, F.L., 1983. Stress deprivation effect on metabolic turnover of the medial collateral ligament collagen: a comparison between 9- and 12-week immobilization. Clinical Orthopaedics and Related Research 172, 265–270. Amiel D, Chu CR, Lee J. Effect of loading on metabolism and repair of tendons and ligaments. In: Funk FJ, Hunter LY (eds) Repetitive Motion Disorders of the Upper Extremity. Am Acad Orthop Surg, Rosemont;1995:217-230. Andriacchi T, Sabiston P, DeHaven K, et al. Ligament: Injury and Repair. Acta Rheum Scand. 1956. 2:109-116. Benjamin M, Ralphs JR. The cell and developmental biology of tendons and ligaments. Int Rev Cytol 2000; 196:85-130. Berenbaum F. Signaling transduction: Target in osteoarthritis. Curr Opin Rheumatol 2004; 16: 616-22. Beach TA, Parkinson RJ, Stothart JP, Callaghan JP. Effects of prolonged sitting on the passive flexion stiffness of the in vivo lumbar spine. Spine J. 2005 MarApr;5(2):145-54. Browner, B. Skeletal Trauma. Volume 1. WB Saunders. Philadelphia, PA. 1992. p 87-88. Chen MR, Dragoo JL. The effect of nonsteroidal anti-inflammatory drugs on tissue healing. Knee Surg Sports Traumatol Arthrosc. 2013 Mar;21(3):540-9. Dagenais S, Yelland MJ, Del Mar C, Schoene ML. Prolotherapy injections for chronic low-back pain. Cochrane Database Syst Rev 2007; (2): CD004059. Fan Z, Chubinskaya S, Rueger DC, et al. Regulation of anabolic and catabolic gene expression in normal and osteoarthritic adult human articular chondrocytes by osteogenic protein-1. Clin Exp Rheum 2004; 22: 103-6. Fleming BC, Hulstyn MJ, Oksendahl HL, Fadale PD. Ligament injury, reconstruction, and osteoarthritis. Curr Opinion Orthop 2005; 16(5): 354-62. Frank CB. 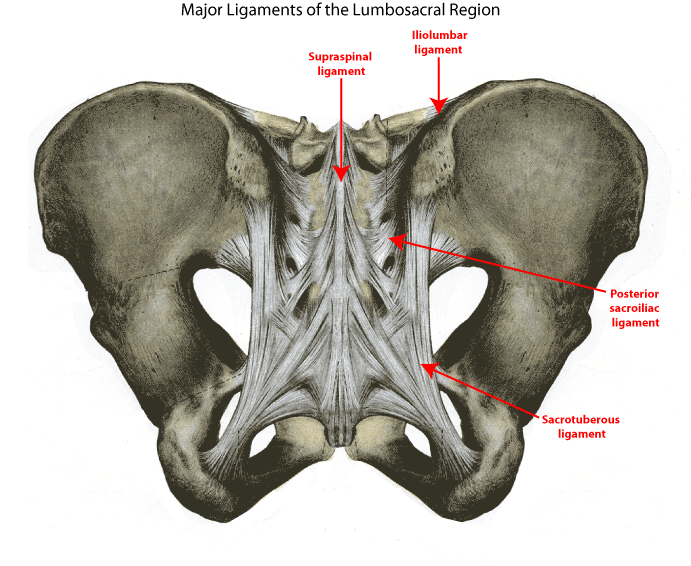 Ligament structure, physiology and function. J Musculoskel Neuron Interact 2004; 4(2): 199-201. Grace PM, Strand KA, Galer EL, Urban DJ, Wang X, Baratta MV, Fabisiak TJ, Anderson ND, Cheng K, Greene LI, Berkelhammer D, Zhang Y, Ellis AL, Yin HH, Campeau S, Rice KC, Roth BL, Maier SF, Watkins LR. Morphine paradoxically prolongs neuropathic pain in rats by amplifying spinal NLRP3 inflammasome activation. Proc Natl Acad Sci U S A. 2016 May 31. pii: 201602070. [Epub ahead of print] PubMed PMID: 27247388. Grood E.S., Noyes, F.R., Butler, D.L. and Suntay, W.J. (1981). Ligamentous and capsular restraints preventing straight medial lateral laxity in intact human cadaver knees. Journal of Bone and Joint Surgery, 63A(8), 1257-1269. Hollander, J.L. (1974). Collagenase, cartilage and cortisol. New England Journal of Medicine, 290(1), 50-51. Institute of Medicine (IOM). Relieving pain in America: A blueprint for transforming prevention, care, education, and research. Washington, DC: The National Academies Press 2011. Jansen JA, Mens JM, Backx FJ, Kolfschoten N, Stam HJ. Treatment of longstanding groin pain in athletes: A systematic review. Scand J Med Sci Sports 2008; 18: 263-74. Jensen KT, Rabago DP, Best TM, Patterson JJ, Vanderby R Jr. Response of knee ligaments to prolotherapy in a rat injury model. Am J Sports Med 2008; 36: 1347-57. Kapetanos G. The effect of the local corticosteroids on the healing and biomechanical properties of the partially injured tendon. Clin Orthop Relat Res 1982; 163: 170-9. Koh J, Dietz J. Osteoarthritis in other joints (hip, elbow, foot, toes, wrist) after sports injuries. Clin Sports Med 2005; 24: 57-70. LaBry R, Sbriccoli P, Zhou BH, Solomonow M. Longer static flexion duration elicits a neuromuscular disorder in the lumbar spine. J Appl Physiol. 2004 May;96(5):2005-15. Leadbetter, W., 1990. An introduction to sports induced soft tissue inflammation. In: Leadbetter, W., Buckwalter, J., Gordon, S. (Eds. 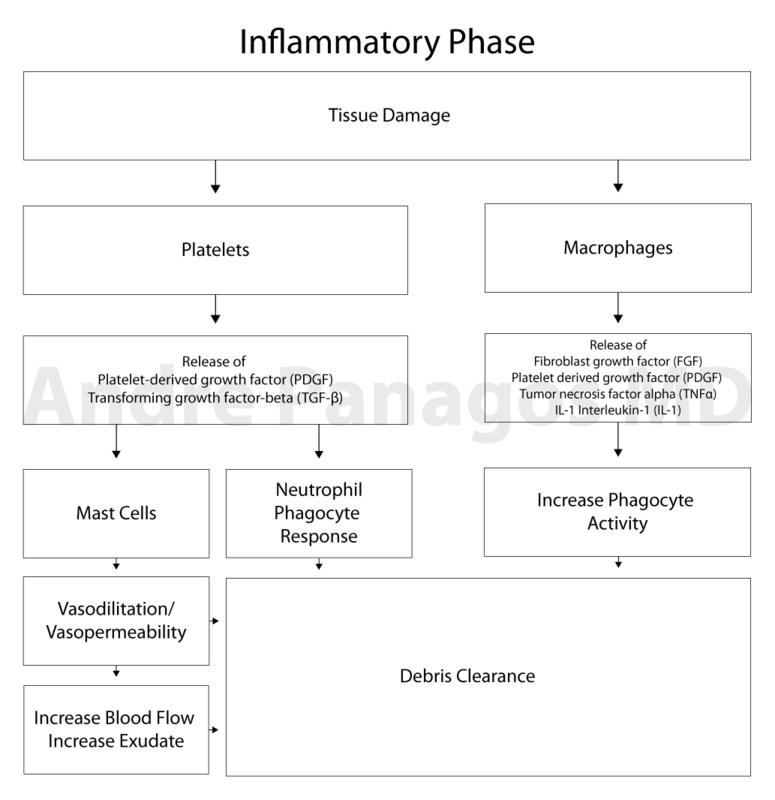 ), Sports Induced Inflammation. AAOS, Park Ridge, IL. Leadbetter W. Soft tissue athletic injuries. In Fu FH (Ed): Sports Injuries: Mechanisms, Prevention, Treatment. Williams & Wilkins. Baltimore. 1994. 736-737. Liu Y. An in situ study of the influence of a sclerosing solution in rabbit medical collateral ligaments and its junction strength. Connective Tissue Research. 1983. 11(2):95-102. Lo IK, Chi S, Ivie T, Frank CB, Rattner JB. The cellular matrix: a feature of tensile bearing dense soft connective tissues. Histol Histopathol 2002; 17:523-537. Lohmander LS, Ostenberg A, Englund M, Roos H. High prevalence of knee osteoarthritis, pain, and functional limitations in female soccer players twelve years after anterior cruciate ligament injury. Arthritis Rheum 2004; 50(10): 3145-52. Marui T, Niyibizi C, Georgescu HI, et al. Effect of growth factors on matrix synthesis by ligament fibroblasts. J Orthop Res. 1997. 15:18-27. McGonagle D, Tan AL, Carey J, Benjamin M. The anatomical basis for a novel classification of osteoarthritis and allied disorders. J Anat 2010; 216: 279-91. McGonagle D, Tan AL, Grainger AJ, Benjamin M. Heberden’s nodes and what Heberden could not see: The pivotal role of ligaments in the pathogenesis of early nodal osteoarthritis and beyond. Rheumatology (Oxford) 2008; 47: 1278-85. Mehallo CJ, Drezner JA, Bytomski JR. Practical management: Nonsteroidal anti-inflammatory drug use in athletic injuries. Clin J Sports Med 2006; 16: 170-4. Menard, D. and Stanish, W.D. (1989). The aging athlete. American Journal of Sports Medicine, 17(2), 187-196. Murray CJL, Vos T, Lozano R, et al. Disability-adjusted life years (DALYs) for 291 diseases and injuries in 21 regions, 1990–2010: A systematic analysis for the Global Burden of Disease Study 2010. Lancet 2012; 380: 2197-223. Nair LS. Prolotherapy for tissue repair. Translational Res 2011;158(3): 129-31. Noyes, F.R., Torvik, P.J., Hyde, W.B. and DeLucas, J.L. (1974). 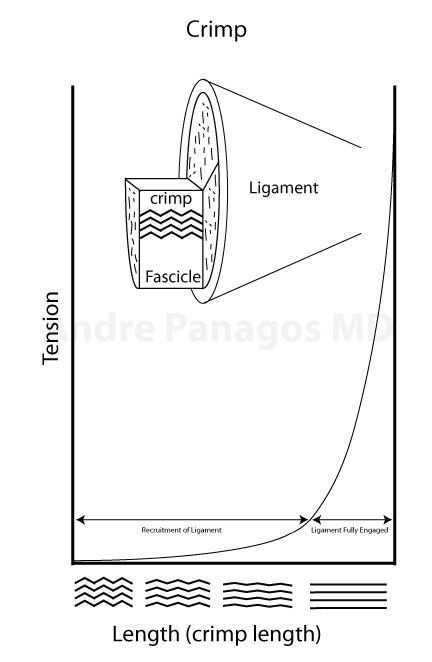 Biomechanics of ligament failure. II. An analysis of immobilization, exercise, and reconditioning effects in primates. Journal of Bone and Joint Surgery, 56A(7), 1406-1418. Ongley MJ, Klein RG, Eek BC, Dorman TA, and Hubert LJ. A new approach to the treatment of chronic low back pain. The Lancet. July 1987. pp 143-146 52. Otsuka Y, Mizuta H, Takagi K, et al. Requirement of fibroblast growth factor signaling for regeneration of epiphyseal morphology in rabbit full-thickness defects of articular cartilage. Dev Growth Differ. 1997. 39:143-156. Palesy PD. Tendon and ligament insertions – a possible source of musculoskeletal pain. Cranio 1997; 15(3): 194-202. Paoloni JA, Milne C, Orchard J, Hamilton B. Non-steroidal anti-inflammatory drugs in sports medicine: Guidelines for practical but sensible use. Br J Sports Med 2009; 43: 863-5. Panjabi MM. The stabilizing system of the spine. Part I. Function, dysfunction, adaptation, and enhancement. J Spinal Disord. 1992 Dec;5(4):383-9. Panjabi MM. A hypothesis of chronic back pain: ligament subfailure injuries lead to muscle control dysfunction. Eur Spine J. 2006 May;15(5):668-76. Peterfy CG , Guermazi A, Zaim S, et al. Whole-organ magnetic resonance imaging score (WORMS) of the knee in osteoarthritis. Osteoarthritis Cartilage 2004; 12: 177-90. Radi ZA, Khan NK. Effects of cyclooxygenase inhibition on bone, tendon, and ligament healing. Inflamm Res 2005; 54: 358-66. Rabago D, Kijowski R, Woods M, et al. Association between disease-specific quality-of-life and magnetic resonance imaging outcomes in a clinical trial of prolotherapy for knee osteoarthritis. Arch Phys Med Rehabil 2013;94(11):2075—82. Rabago D, Patterson JJ. Prolotherapy: An effective adjunctive therapy for knee osteoarthritis. J Am Osteopath Assoc 2013;113(2): 122-3. Rhalmi S. Immunohistochemical study of nerves in lumbar spine ligaments. Spine. 1993. 18:264-267. Roy S, Loh H. Effects of Opioids on the immune system. Neurochem Res 1996; 21(11): 1375-86. Safran, M. Elbow injuries in athletes: a review. Clinical Orthopaedics and Related Research 1995. 310, 257–277. Sanchis-Alfonso V, Roselló-Sastre E. Immunohistochemical analysis for neural markers of the lateral retinaculum in patients with isolated symptomatic patellofemoral malalignment. A neuroanatomic basis for anterior knee pain in the active young patient. Am J Sports Med. 2000;28:725-31. Sbriccoli P, Yousuf K, Kupershtein I, Solomonow M, Zhou BH, Zhu MP, Lu Y. Static load repetition is a risk factor in the development of lumbar cumulative musculoskeletal disorder. Spine. 2004 Dec 1;29(23):2643- 53 14. Scutt N, Rolf CG, Scutt A. Glucocorticoids inhibit tenocyte proliferation and tendon progenitor cell recruitment. J Orthop Res 2006; 24: 173-82. Seybold VS. The role of peptides in central sensitization. Handb Exp Pharmacol. 2009;(194):451-91. Solomonow M. Ligaments: a source of musculoskeletal disorders. J Bodyw Mov Ther. 2009 Apr;13(2):136-54. Solomonow, M., Baratta, R.V., Zhou, B.H., Shoki, H., Bose, W., Beck, C., D’Ambrosia, R. The synergistic action of the ACL and thigh muscles in maintaining joint stability. American Journal of Sports Medicine 1987;15, 20–213. Solomonow M, Baratta RV, Zhou BH, Burger E, Zieske A, Gedalia A. Muscular dysfunction elicited by creep of lumbar viscoelastic tissue. J Electromyogr Kinesiol. 2003 Aug;13(4):381-96. Suominen, H., Kiiskinen, A., Heikkinen, E., 1980. Effects of physical training on metabolism of connective tissues in young mice. Acta Physiologica Scandinavica 1980;108, 17–22. Tan AL, Grainger AJ, Tanner SF, et al. High-resolution magnetic resonance imaging for the assessment of hand osteoarthritis. Arthritis Rheum 2005; 52(8): 2355-65. Tan AL, Toumi H, Benjamin M, et al. Combined high resolution magnetic resonance imaging and histological examination to explore the role of ligaments and tendons in the phenotypic expression of early hand osteoarthritis. Ann Rheum Dis 2006; 65(10): 1267-72. United States Bone and Joint Initiative: The Burden of Musculoskeletal Diseases in the United States (BMUS), Third Edition, 2014. Rosemont, IL. Available at http://www.boneandjointburden.org. Accessed on November 20, 2015. Williams M, Solomonow M, Zhou BH, Baratta RV, Harris M. Multifidus spasms elicited by prolonged lumbar flexion. Spine. 2000 Nov 15;25(22):2916-2. Vallejo R, de Leon-Casasola O, Benyamin R. Opioid therapy and immunosuppression: a review. Am J Ther. 2004 Sep-Oct;11(5):354-65. Wang X, Loram LC, Ramos K, de Jesus AJ, Thomas J, Cheng K, Reddy A, Somogyi AA, Hutchinson MR, Watkins LR, Yin H. Morphine activates neuroinflammation in a manner parallel to endotoxin. Proc Natl Acad Sci U S A. 2012 Apr 17;109(16):6325-30. Warden SJ, Avin KG, Beck EM, DeWolf ME, Hagemeir MA, Martin KM. Low-intensity pulsed ultrasound accelerates and a nonsteroidal anti-inflammatory drug delays knee ligament healing. Am J Sports Med 2006; 34: 1094-102. Wheaton MT, Jensen N. The ligament injury-osteoarthritis connection: The role of prolotherapy in ligament repair and the prevention of osteoarthritis. J Prolotherapy 2011; 3(4): 790-812. Woo, S.L.Y., Gomez, M.A., Sites, T.J., 1987. The biomechanical and morphological changes in the medial collateral ligament of the rabbit after immobilization and remobilization. Journal of Bone and Joint Surgery 69A, 1200–1211. Woo, S.L.Y., Ritter, M.A., Amiel, D., Akeson, W., 1980. The biomechanical and biochemical properties of swine tendons: long term effects of exercise on the digital extensors. Connective Tissue Research 7, 177–183. Ziltener JL, Leal S, Fournier PE. Non-steroidal anti-inflammatory drugs for athletes: an update. Ann Phys Rehabil Med. 2010 May;53(4):278-82, 282-8.